Blast targets, swim like a fish and stick the landing in Sega's impressive sports game. Last week, Capcom wowed 3DS owners with a demo of Resident Evil: Revelations, and now it's Sega's turn with Mario & Sonic at the London 2012 Olympic Games. Similar to Revelations, you'll need a hefty chunk of memory to download the file (over 900 blocks), and can only play the demo 30 times, as in exiting to the 3DS Home screen and then re-launching the software. Once the demo begins, you're free to play as many times as you want. The retail game, launching February 14, comes with over 55 events, and Sega did a great job selecting five to put on display, where the object is to defeat three computer opponents and take the gold medal (or silver and bronze) with a score based on your entire performance. You even play as a different character in each contest. First up is 25m Rapid Fire Pistol, and we have to admit, this one's super addictive. As Eggman, Sonic's arch nemesis, the goal is to nail five targets as a cursor moves from right to left, pressing the R button to shoot. The game comes with three rounds, each one growing progressively faster. There's a nice rhythmic element to it, as you anticipate when the cursor will pass over the bulls-eyes and then quickly tap R five times to score a perfect 50. Not easy, but a lot of fun and worth coming back to. 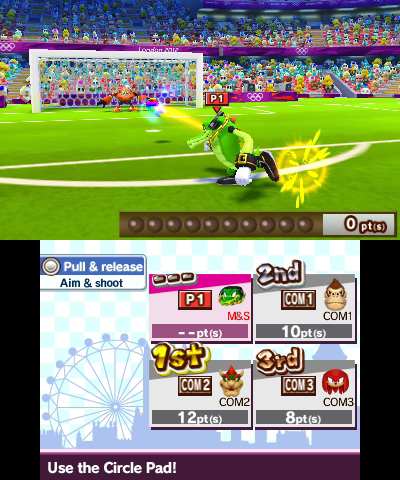 Next, we have football, aka soccer starring Vector the Crocodile, and played primarily with the Circle Pad. A computer controlled teammate performs a corner kick, and it's your job to send the ball into the net. You do this by pulling down on the Circle Pad, adjusting the angle by tilting it ever so slightly and then releasing it to hopefully score on a defender or two. Again, very addictive and a lot of fun. If anything, it's over too soon. After that, we enjoyed some Trampoline action with Bowser Jr. This sort of reminded us of Elite Beat Agents in the sense that once he leaps into the air and towards the screen, a perfect landing heavily depends on your ability to press A right when an outer circle meets the inner circle. 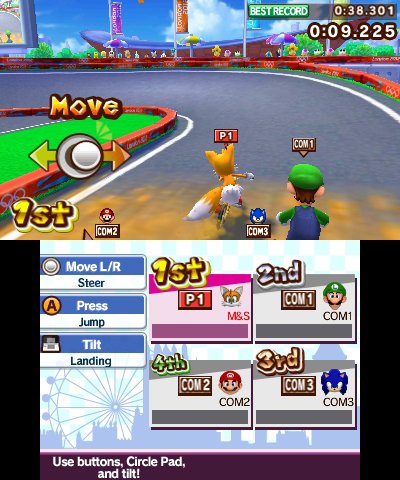 At the same time, you must also keep Bowser Jr. within an outlined rectangle using the Circle Pad. Definitely enjoyable. Having dominated that event, we moved onto the 100m Backstroke. 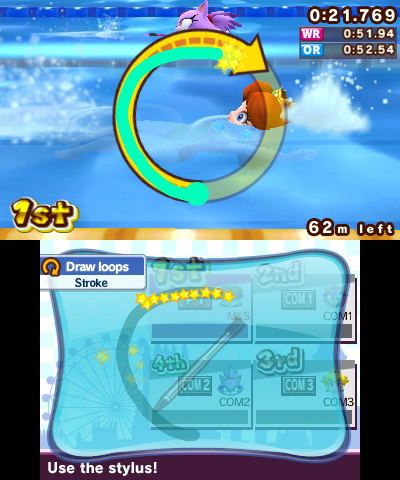 To help Princess Daisy along, you draw circles (counterclockwise at first, then counterclockwise when she heads back to the starting point) along the touch screen, doing your best to stay within a circle located on the top screen. It felt weird tracing a shape displayed on a different screen, but we took first anyway. Finally, we concluded the circuit with BMX featuring Sonic's buddy, Tails. Here, you press A to jump, the Circle Pad to steer and the 3DS gyroscope to land/pull off tricks. The key to success involves tapping A right when the character passes across multi-colored arrows laid along the track for added boost. We fell behind early, then managed to recover and place third. Despite that BMX hiccup, we still received the gold medal. Take that, Mario. As for the game, we like it so far, and look forward to seeing the rest of what Mario & Sonic at the London 2012 Olympic Games has to offer when it appears on shelves next month.